The Korean War began on June 25,1950 when North Korean troops crossed the 38th parallel and invaded South Korea. Although there had been some limited United States troops in South Korea since 1945, it was the North Korean invasion that prompted President Harry Truman to authorize additional forces in accordance with United Nations sanctions. The mandate of the United Nations was to stop the illegal invasion and preserve the territorial integrity of South Korea. The early actions of the United States forces in Korea were not very successful. This was due in part to a lack of preparedness and training as well as the over­whelming number of opposition forces. After being driven back below Seoul to the Pusan peninsula, the main U.N. mission was to recapture Seoul and push North Korean forces north of the 38th parallel. After a daring and brilliantly conceived landing at Inchon, the U.N. forces were successful in pushing North Korean forces back decisively. The United Nations drive to the north met sudden resistance when Chinese Communist troops entered the conflict in November, 1950. Initially after the Chinese communists entered the conflict, the balance of war shifted to the communist forces, but with their small gains came a terrible cost. As the balance shifted back to the allies, a difference in command policy developed between General McArthur and President Truman, leading to McArthur's dismissal. By the end of 1951, the nature of the war shifted dramatically to a series of local battles for strategic positions rather than all-out offensives. These bitter struggles for hilltop positions and small chunks of land became the bargaining chips for negotiators who had already begun truce talks. These costly battles also produced the legends of Old Baldy, Jackson Heights, T-Bone and Pork Chop Hill that fed Hollywood to produce their own version of the war. Although the truce talks began in 1951, the bargaining at the truce table proved to be long and highly disputed. It was not until July, 1953, that negotiators could finally agree on a truce agreement and on July 27,1953, that agreement was signed and it continues today. In all, sixteen nations provided troops to the United Nations command. 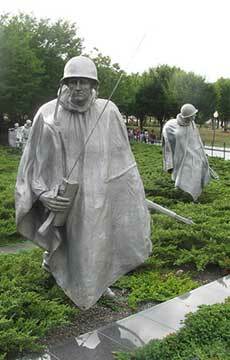 The Korean War proved to be an extremely costly in terms or lives lost. There were 54,200 deaths during the period of hostilities - of these, 33,700 were battle deaths. And, as we try to deal with this horrific number, remember this - there were 227,800 South Korean KIAs. If we take the total killed, wounded, captured and missing in action, the South Korean figure reaches nearly one million.